Who doesn’t want a body like Nina’s? The soon-to-be 22-year-old NINA DOBREV reveals her secret how to maintain a healthy body. NINA DOBREV has admitted that she works “crazy” hours on The Vampire Diaries. The actress plays the roles of vampire Katherine Pierce and doppelganger Elena Gilbert in The CW series and spoke to the Vancouver Sun about the workload. Discussing the differences between the two characters, Dobrev said: “As Katherine, I can get away with a lot more and say a lot more and be a little bit more edgy and bad. She has a very playful personality. As soon as I put on the heels and they start curling my hair, I’m in the zone. NINA DOBREV chats with Dose about Vampire Diaries. The first few episodes of The Vampire Diaries followed the standard vampire formula: young Elena (Dobrev) meets and falls for Stefan Salvatore (Paul Wesley), unaware that he’s a centuries-old vampire – or that his brother, Damon (Ian Somerhalder), is similarly afflicted and has been attacking the town’s residents. But once Elena discovered the Salvatores’ true nature, The Vampire Diaries let loose, employing a breakneck pace of storytelling rarely seen on other shows (ahem, Lost). That’s not to say that The Vampire Diaries sacrifices character development; rather, showrunner Kevin Williamson seems to have realized his actors’ talent and has written their characters accordingly. Dobrev and her costars are constantly acting out the devastating emotional consequences of living such dangerous lives: Stefan has shown to have a dark side, while Damon has struggled to confront both his feelings for Elena and his more destructive tendencies. Dobrev has the added challenge of playing two characters: the well-meaning Elena, and Katherine, her evil vampire doppelganger who wouldn’t hesitate to snap the spine of an innocent bystander. And while Elena may not be as over-the-top as Katherine, Dobrev appreciates that she’s evolved beyond the sulky teenager who is constantly in danger. Of course, the extra work load can take its toll. “I’m not sleeping very much!” Dobrev laughs. “The hours are pretty crazy and I’m working a lot; I’m actually becoming a vampire in my own right. 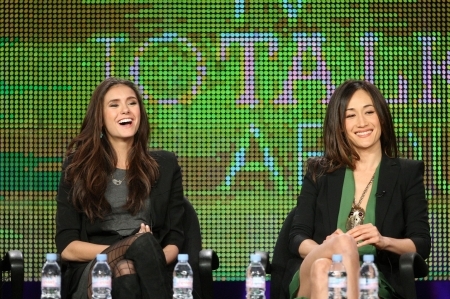 The roles aren’t without their challenges: she admits that she sometimes struggles to understand Katherine’s motivations, especially her die-hard love for Stefan. As for Elena’s relationship with the Salvatores, Dobrev praises its layered, complicated nature and commends the writers for not backing off for the sake of convenience. The love triangle is so complicated, Dobrev says, that she can’t come close to answering the one question of every Vampire Diaries fan is asking: who should Elena end up with? And if the writers have any idea, they’re not telling.